The publication An IPM Scouting Guide for Common Problems of Brambles in Kentucky was first introduced in 2018 as an online/paper version. In order to improve access to this important scouting guide, a mobile website was developed. The Bramble Scout website is now available for grower, agent, and homeowner use. The website can be easily accessed from any phone, tablet, iPad, or computer. This website provides users with the information available in the scouting guide publication. The home page (Figure 1) allows visitors to select a topic. 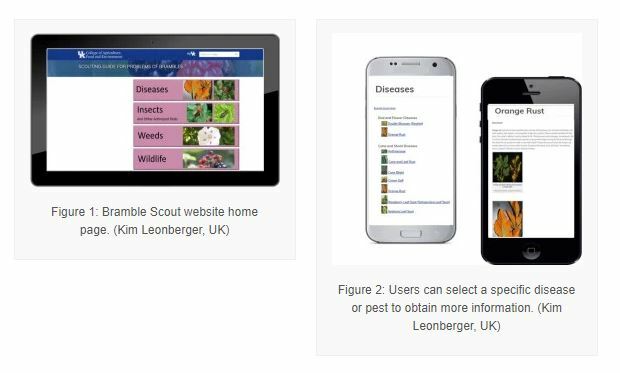 Next, users can select from a menu of various diseases or pests to obtain more information and view images (Figure 2).